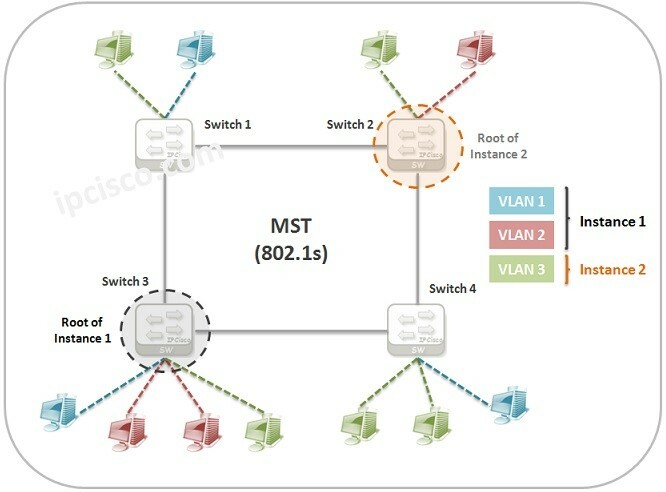 MST (Multiple Spanning Tree) is the version of STP thatg allows multiple VLANs to a single instance. It is the standard based protocol defined with IEEE 802.1s. In normal STP (CST) and RSTP, STP process runs for whole the devices in all VLANs. In PVST+ and RPVST+, STP process runs for a specific VLAN. These two approaches has their advantages and disadvantages. For example, for whole network, having only one STP can cause convergence problems. Or, if you have many VLANs and for each VLAN, using a specific STP instance can be require more resources. MST (Multiple Spanning Tree) is overcoming these limitations and disadvantages and provide arbitrary instance for a number of VLANs. You can group VLANs in a specific instance with MST. For example, if you have ten VLANs. You can group four of them in instance one and the rest six of them in instance two. If you have too much VLANs as a large company, MST will be more advantageous for your company. Each MST region can have Maximum 65 MST Instances (MSI). These instances can be a value from 1 to 4094. Here, the Instance 0 called IST (Internal Spanning Tree) and it is a special instance for each MST Region. All the VLANs are assigned to IST by default. After you assign any VLAN to another instance, after that, this instance is the member of that instance. MSTIs are local for an MST Region. So, a same MSTI can exist on an another MST Region. CIST is the mechanism that interconnects all the MST regions and the other STP domains.